Guidance from the World Health Organization recommends eating a minimum of 400 grams of fruit and vegetables a day to lower the risk of serious health problems, such as heart disease, stroke, type 2 diabetes, and obesity. However, many millions of people across the world regularly miss their nutritional targets, prompting researchers to look at alternative ways to extract and introduce important vitamins, minerals and other naturally occurring chemical compounds — such as ellagitannins — to fortify and enrich daily diets, according to the The Institution of Chemical Engineers. If you want to slow down your aging process and preserve your brain’s vitality and function, the secret to doing so may surprise you: blackberries. These delicious, juicy berries have phenomenal anti-oxidant properties that boost brain power and nourish the body. Dr. Verma’s Verdict: Juice Cleanses — Hype or Healthy? A 2009 study published in the medical journal Nutritional Neuroscience showed that the consumption of blackberries has a very beneficial and positive effect on cognitive and motor skills, which inevitably decline with age. The study involved feeding blackberries to aged rats for eight weeks in comparison with a placebo group. The blackberry fed rats showed improvement after eight weeks in their ability to perform tasks, as well as displaying better balance, coordination, memory, and motor coordination skills. This may be attributed to high polyphenol concentrations. In addition to being amazing for your brain, blackberries contain compounds such as ellagic acid, rutin and gallic acid, which have antibacterial, anti-viral, and anti-inflammatory properties. 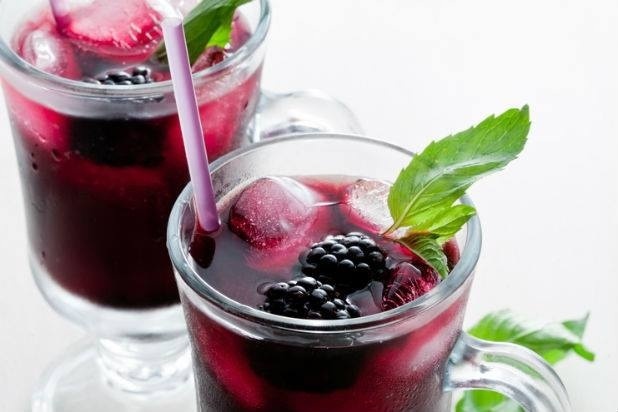 Researchers from the University of Kentucky and University of North Carolina studied the effects of blackberry extract’s antibacterial properties on periodontal health which has been thought to contribute to heart health. Results hold promise that blackberries can play a role in preventing and treating periodontal disease. Blackberries are also considered a superfruit, one of the best in the category. These plump and juicy berries are low in calories (70 calories per cup). That means you can consume a lot of this wonder-fruit without having guilt or sabotaging your weight loss goals. These delicious berries contain many micronutrients that work wonders in the body. So grab a handful of blackberries and make a smoothie or a fruit juice — take a look through our slideshow to see more reasons blackberries are great for your brain and heart health, as well as for some great blackberry recipes.